Criteo Dynamic Retargeting drives sales for e-commerce businesses, intelligently converting shoppers with dynamic, personalized ads. Work for Criteo Dynamic Retargeting? Honestly, performance with Criteo has mostly outperformed other partners when comparing dynamic retargeting via product feeds. The algorithm seems to be very strong, and I like how I can check on the status of my product feed in the interface (i.e. how many products are in the feed, how many are live/ recommendable, etc). I dislike the creative capabilities; I wish there were more customizable options to display our dynamically generated products. We have a lot of clients that want to make the look and feel of the ads just like their homepage or other ads, and want to have a bigger say in how things are positioned. Also, the native formats of the dynamic creative can get sloppy with images resized incorrectly, wording falling off, etc. I wish there was a section where we can upload customized naming conventions or categories for the products. Make sure the solution aligns with what you're trying to accomplish. If you want to run multiple campaigns with the ability to make a bunch of changes in the campaign throughout, swapping out creative constantly, Criteo might not be the vendor for you. You have to let go of the reins a little when it comes to creative implementation and testing, but it's worth it for the algorithmic capabilities of advertising a 200+ product feed at the budget you can afford. We've benefitted from the ability to target shoppers for different kinds of products at once (from hundreds to choose from) in an efficient way. We don't have to segment out different campaigns for all different product groupings. We're also now able to align remarketing with seasonality by increasing CPC bids on specific product categories that are in season/ need to get off shelves without removing other less important products from the feed itself. The online interface is easy to use and it's easy to make changes to your campaigns. Support from the criteo team has been at times hard to get. We have had a hard time hearing back from them in the past. There have also been occasional issues with frequency and oversaturation, as we've gotten complaints from clients for whom we run criteo that they're seeing too many ads from their own business. Make sure to pay close attention to your frequency caps, as these can get out of control in general but my agency has had more issues with Criteo in the past than with other dynamic retargeting partners. Criteo dynamic retargeting gives us the option to remarket to our past site visitors and brand engagers in an effective way. With the opportunity to launch custom banners for specific promotions, we are able to capitalize on our clients' initiatives quickly. The team we have at Criteo is really responsive, and always happy to provide more information for the client. The team has also hopped on the call with us and the clients a few times, to answer questions the client has had, as well as to discuss new opportunities. It would be nice if we had a little better control over how our budgets pace- as it stands now, we have a tendency to spend our budgets within the first week or two of the month, and we aren't always able to get more funds from the client. 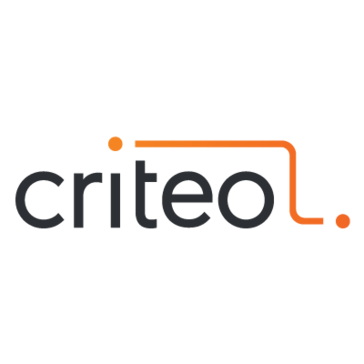 I would definitely recommend Criteo to others, and we have suggested it to our other retailers. We were utilizing Google for dynamic remarketing and weren't receiving a very high ROAS. We were able to double our ROAS with Criteo, and drive more revenue overall. "Great set it and forget it (mostly) re-targeting"
They have inventory across most major platforms (i.e. Facebook and Google), so this is easier to manage than using re-targeting in individual platforms. Integration is pretty straightforward. Their client success team is pretty responsive. Some aspects of control are limited, like changing creative or adding a promo to banners, but they do address it all pretty quickly. The team can be a bit pushy to spend more and it can be tough to control budget unless you use smoothing, which is something I had to ask about so that it was recommended. There was an issue with cookies on IOS safari browsers, so it would be good to check on the audience size that's covered as consumer privacy continues to evolve. Getting consumers back to our site and driving incremental revenue. "This works better than the rest"
I think you need to take what you know about retargeting and set it aside. This platform works differently. Like with everything, you can't just give it one week and expect it to work flawlessly. But, it works great! This is the best re-marketing we've used. It grabs second layer funnel and kicks it into high gear. "Probably the best tool for display retargeting"
It is performance based, you pay CPC in an environment that is CPM so you can budget based on your goal CPL vs. display campaign. You have very little work to do, they figure out how to optimize the audience, display frequency, etc. A lot could be more automated. it is difficult to get product level traffic, the data is at the campaign level. They need a lot more self-service for uploading your own, no support for audio and video ads. I wish they were more self-service vs. white glove service like now. Start with the core product, see how it performs for you then look into prospecting. Retargeting abandoned web visitors with highly targeted ads. "Run ads and never expect support"
I hate the fact that it is impossible to get in touch with customer support. You can send 30 emails and wait days for them to reply. You can call every single location they have and all of them say the mailbox is full (they have dozens of locations). I am calling during business hours, leaving emails, and there is no other way to get ahold of someone there. The Criteo specialist team uploaded the wrong website feed to our account sending our customers to the wrong site, advertising the wrong products, and we're paying to all of this and getting dozens of calls and emails from angry customers. This is making us look terrible as a company and on our brand. Right now this is only causing business problems and not fixing anything. "Great performance, great support, OK ad creative"
Campaign performance is great, with the CPC model, we can better track KPIs in other platforms, such as Google Analytics. The ability to control spending very closely, together with automated bid management is very helpful. The team is very supportive and the user interface easy to use. Dynamic ad creative is not always the best, sometimes because of the layout, sometimes due to the quality of the product images. We can add static overlay images to improve creative assets, but the dynamic ads may not be ideal, depending on how concerned you are about branding and brand guideline. Make sure to compare with other platforms. In our case, we noticed Criteo Retargeting wasn't always the best performing solution across all different clients. Different brands have different audiences, and this may not resonate with all your target audiences. In instances when Criteo performed better, it was very clear, so I definitely recommend testing it and comparing with performance from other products/platforms. They also have an upper hand in terms of support. Very efficient retargeting campaigns. Having the support of a team on the backend is also very reassuring and improves efficiency in campaign updates. "Easy to set up and maintain"
I like that the platform runs by itself. It doesn't require a lot of labor on our end. Even with the little effort, the system is able to target qualified users and get them to return to the site at a comparable return on ad spend to our other marketing efforts. The service is a bit of a black box, I like to be able to debug when things go wrong. Fairly easy to set up. They pull products from Google Shopping feed and then add a tag to the site. They then create the ads for you and then display them on the display network to users based on the site tag. We tried Adroll before, but switched because we weren't getting a good return on ad spend. We are getting a much better return with Criteo that is comparable to our other marketing efforts. It allows us to get more traffic back to our site after people have left. More traffic from qualified leads = more revenue. It also allows us to reduce the amount of labor we spend optimizing display campaigns since all of that is handled on their back-end. Very easy to get started; setup was a breeze and required very little effort on our part which was a huge plus. Detailed reporting and analytics are easy to access and view all in one central spot. Ads are well designed and look professional. Sometimes when we approve a recommendation to increase our bid for ad space before a weekend or at the start of the month the bid amount will be too high and our monthly budget will be spent within a few days or a week which limits the advertising we can do for the remainder of the month. Criteo helps us keep our brand name in front of potential customers once they've left our website with minimal effort required from us. They save us time and money by targeting the customers that are most likely to respond to our ads and return to our website to make a purchase. We have an increased web presence now. 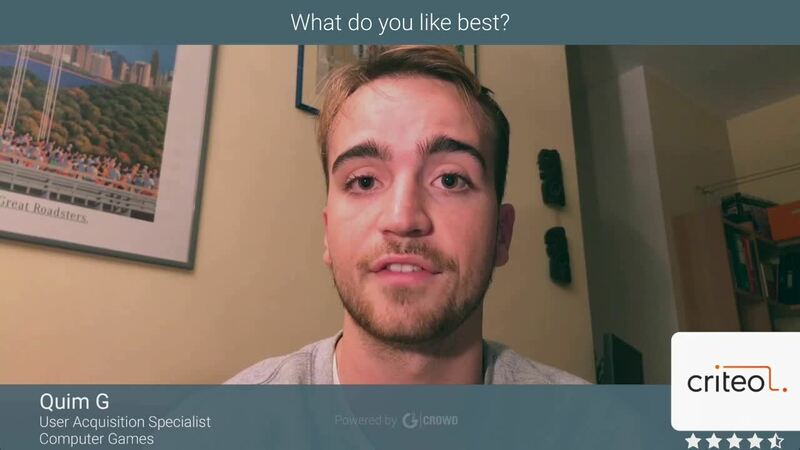 "Best in Class Retargeting Services by Criteo"
I like the breadth of knowledge of Criteo's team and the extensive retargeting services that are able to be offered. Compared to other retargeting services, Criteo is the most feature-rich. After historically accumulating a great deal of time from sign-up, Criteo shifted our account over to a managed services team with less person-to-person interaction on a weekly basis to give status updates on our account. That has been a bit more challenging as most discussion now occurs over email and there is more of a time delay in trying to make changes and adjustments. Evaluate what else is out there in the market, but understand that Criteo is a leader in the industry and is very likely the partner you are looking for to be able to reach your goals. Criteo has completely changed the way we do business online and is a service I would recommend to any business that operates an online ecommerce presence. Capturing lost traffic has been huge. The ability to place advertising that is relevant to a user that is familiar to our brand is extremely important. Using Criteo Dynamic Retargeting has created a new sales channel for our company. "Helpful Remarketing but Room for Improvement"
the reporting dashboard is helpful to customize fields and turning different metrics on and off. The budget types are helpful to override, add, etc. that I can't see where my campaigns are most successful (mobile vs desktop, social media vs partner websites, etc.). I understand that the "engine" is supposed to learn and is driven by that, but it would be nice to override an area when one can't figure out why spend either is going nowhere or gets out of hand. Also wish the engine had better way to suggest daily spend based on monthly/daily budget instead of just guessing on bid for CPC. "Criteo Lied and Defrauded Me - Do Not Recommend!" Nothing. they got me 0 sales. It was terrible. Criteo promised to have an active account manager on my account to optimize our advertising with them for the holidays. We agreed to $300 worth of advertising to test their program. They started the campaign and started charging us, but the person who was in charge of optimizing our ads, left their company, and nobody did the work on our account to optimize it. They charged me $300 anyway and when I disputed it and offered to compromise by offering them $100 as a courtesy to them, even though they completely failed in their services, they refused and sent our bill to a collection agency. Now I have a bill for over $350 and interest is continuing to accrue at collections. Criteo is a fraudulent company that lies about their services and does not honor their customers! Terrible company. They already have an "F" rating with the BBB. Now I know why. do not recommend! they are terrible and do not uphold their promises and charge you anyway! nothing. they lied and cheated me. "Ok software with good service"
The dynamic product placement in the ads is helpful for ecommerce. The account success manager is always making suggestions to help optimize the campaigns. Issues with the feed integration has lead to out of stock products shown in our ads. The coupon and discount ability could use some upgrades. I would suggest to make sure you can easily manage your budget and bids with whatever software you choose. Criteo identifies website users that were interested in buying but left our website before making a purchase and shows them display ads when possible. This has been helpful to our conversion rate. "Solid Performance, But a Black Box at Times"
Criteo, as a retargeting platform, has always managed to hit our KPI's. It's a very "bare bones" platform and it has the ability to scale your retargeting efforts quickly. It's also fully managed by Criteo, which can be good and bad. It's good because it requires very little from my account managers and it allows them to focus on other areas. Lastly, the back end tagging process was very simple. Sometimes, it can feel a bit like a "black box". In terms of their UI and ability to use their reporting for actionable insights, they are pretty limited. Also, their customer support has been very inconsistent. Another thing that we aren't crazy about is how they rotate and optimize creative. We've provided tons of different images to test, however the vast majority of the time Criteo will just serve a "dynamic" ad. This might seem ideal, however the quality is often very, very poor and they aren't always super relevant. Make sure you consider some of the other products out there. Truly, your decision will come down to your needs and goals. If your goal is volume, minimal day to day work, and a managed service, then Criteo is a good option. However, if your goals include customer segmentation, geo targeting, granular reporting, and more, then there are better solutions out there! We use Criteo as a retargeting platform. They help us keep customer engaged with our brand, as well as bring users back into our customer flow. "Great network and hard penetration"
The size of the publisher Network is really huge. I haven't see any other network that show me the retargeting ads on so many touchpoints. Very complicate to set up the visuals for the ads. There is a base of standard visuals where you can choose a design, but if you don't like the design you can not go there and change it or upload a new one, you always have to contact your account manager who on his side afterwards contact the designer which needs a little time. We do retargeting with criteo. All vistitors of our site get there last seen products or similar products in the predefined retargeting ads. I like the overall reach that Criteo has and they have performed higher than other past remarketing partners we worked with. The platform is also very easy for us to use. I do wish that there were better creative capabilities as it would be great to work outside their default templates and to even incorporate more video. Bringing users back to our site after they browse our products, and we realized that sometimes it takes multiple ads outside of just visiting our website to keep our company top of mind for the shopper. The results have been great. Also love how minimal and hands-off the channel is when combined with their customer success teams. Generally quite responsive and courteous. Some of the account managers have been the best we've had as an agency. The dashboard is a bit outdated, as is the pixel. Not having at least some direct control. It's all through their team. Capturing business from otherwise qualified leads that simply don't check out the first time—perhaps due to time or just looking at the wrong product. I would like to briefly present my year-long adventure with Criteo. Throughout the period of cooperation, I had the impression that the support employee is incompetent. Answers to my questions were often incomplete or evasive. The waiting time for payments was also very long. However, the real problems began at the beginning of this year. Suddenly, overnight, Criteo stopped counting ads impressions. At the beginning, I ignored this problem because it happened before, but always at a later time the failure was removed and funds were added to the account. This time, however, it was different. I did not get an explanation of this situation, so in the end, I decided to part with Criteo completely. At this point, I still had some funds earned in the account, so I sent a question what will happen to them after closing the account? I received the answer:"You will be paid end of this month and your account will be closed 2 months afterwards." So I closed my account on 06.02.2018 and waited. At the beginning of March I still did not receive my money, so I sent a query and the answer just shocked me "after consulting with our Finance Department, I have received the information that your account has been closed by you and therefore it triggered a payment of all combined amounts of a final .... EUR. The amount was paid on the 26th of January 2018." My explanation that this payment concerned the previous period was unanswered, and I still have not received my money. Subsequent questions remain unanswered. I am currently trying to contact senior staff and I hope that this will have some effect. Generally, however, I advise against any cooperation with this company. I tried to diversify the source of revenue on the website. We’re sorry to hear about your recent experience. It is our priority and goal to do everything we can to service our publisher partners in a timely and effective manner. We have recently communicated a change in access to the Criteo Publisher Marketplace Passback Technology and you might have missed this. Please reach out to publishers@criteo.com so that we can discuss ways for you to access Criteo’s demand and monetize your inventory with us through our RTB connections with SSPs and ad exchanges. The automation facilitates working with the tool. It minimize time spent on it which we appreciate. The bidding is managed and optimized by the criteo team. The lack of segmentation. We must limit our messaging since we cannot segment users by purchase behavior. Also lack of reporting data on orders. The downloading process of images can be tedious. This tool is great for automation, low management but will lack some reporting features such as being able to download transactions. Like any good retargeting product, the results speak for themselves. We definitely generate additional sales from using the Criteo product and therefore have been using it for years. Ever since I lost my dedicated account manager, I have felt that support lagged. The accelerate team model is inferior to the dedicated account executive model. Definitely give it a try and compare the results to your existing product (if any). Keeping top of mind awareness for our brand and products is the most significant benefit to the Criteo product. Also, we do generate incremental sales. "Least Time Consuming Method of Retargeting (But limited control)"
Criteo's interface is incredibly simple to use, and their customer support team handles most of campaign set-up and optimization. I am not required to spend time reviewing placements, bids, and creative because they handle the coordination of everything. Our ROI isn't as high as we'd like on this platform, although I'd guess that varies widely depending on industry. Additionally, I'd love more control over how our creative looks. The ads are dynamically generated based on user activity, but some of them end up looking pretty poor. Keep constant communication with the Accelerate team. This is how your campaign is optimized. Additionally, be flexible on bids - they vary widely depending on the time of year. We have struggled finding an easy-to-manage retargeting platform for our business, and Criteo has met that need. There is very little hands-on managing, and the majority of the work is handled by their Accelerate support team. That we pay based on CPC and the dynamic targeting capabilities. That means that even if our CTR is low, we only pay for the traffic that's been driven. The lack of transparency to which placements our ads are being served in. I also wish to have more control over the campaigns. The reporting can be more specific as well. Use it for your lower funnel traffic. More focused targeting with the dynamic retargeting aspect. Without Criteo, we can only do this through Facebook through their DPA. "Best retargeting partner there is." The performance, the people and the ease of use. Criteo has consistently met and surpassed our performance goals within our stated budgets. The Criteo team provides consultation that is extremely helpful within and outside of dynamic retargeting. I could not recommend Criteo more! Nothing really. I wish there were more manual levers but not always needed. It would also be great to have more visibility into inventory-specific performance. Don't waste time on vetting any other retargeting partners. Criteo is your solution. Growing our membership base and taking advantage of the low hanging fruit in our funnel. Criteo is a programmatic solution that you don't have to micro-manage nor stress about. The technology is superior with dedicated account management teams that strive to be your trusted advisors. "Gets the Job Done at Scale"
I like how its a money machine and sweeps up all the traffic you've paid for across other channels. I like how once you set it up its basically plug in and play. You don't have to look at it everyday because you know its doing its job. I dislike how long it takes the algorithm to adjust to a COS % goal change. I also dislike how the algorithm doesn't have any auto bid feature like Facebook advertising. It would be nice to be able to test auto bidding versus manual bidding. It's way better than Google Display Remarketing. Criteo Dynamic Retargeting solves the problem of losing valuable traffic we already paid for and instead is able to turn them into customers. I like that it allows us to have visibility on websites like Macy's, Kohls, etc... Ever since they bought out hooklogic it's been a fantastic addition to their tool kit. I dislike the attribution model. It seems to me like they over attribute when looking at sales attribution for non-last click sales. In their words, sales from views + clicks versus just last click. Thankfully, the last click attribution balances out those numbers and seems to be more reliable. If you are using the criteo/hooklogic tool, realize that it doesn't work the way adwords or even amazon marketing services works. They bid based on product category, not keyword. It's one of the only tools out there that allows you t advertise in retail for major department stores. I am solving the business need to compete in the online department store sphere. The benefits I've seen are increased sales and awareness of brands through the hooklogic/criteo advertising model. Criteo is a simple service that delivers effective retargeting ads. For the most part, we just set it and forget it and the results speak for themselves. From time to time when we make changes, the service from the team at Criteo has been great. There's not a lot of transparency, and controlling the product feed is a bit of work. However none of that is deal-breaking. solid ROI for mid and low funnel retargeting. We've improved the service we had and our campaigns performance has bieen growing. We haven't had the proper follow-up on the Dynamic Creatives, not only from Criteo's end but also from our end, but that's something we haven't explored that much and we would like to do. Great Retargeting tool, without the DCO works great, I bet with DCO works even better. We use it to generate bookings on hotels & resorts, so the retargeting that Criteo does has been really helpful. They may be in the business associated with arbitrage. They may not be a within the business in enhancing for what performs greatest for you, no matter what these people say. They are right now using some sketchy techniques to bypass the brand new firefox 3rd part cookie guidelines in a way that will can screw up your stats attribution. Only use if you have money to spend. Recording sales from visitors who else leave our site with out purchasing. Helped increase total site conversion in a new very competitive industry (fashion ecommerce). "Performance focused, iffy account management. " Criteo is probably the most performance driven retargeter out there. CPC focus ensures impressions aren't wasted. High turnover among account managers. AMs also stretched very thin - some have a ton of clients so can be hard to get a hold of them. Clients are put into tiers and if you are in a low tier, you get low tier AMs. Very results focused - must have solution for any ecommerce brand. CPO is typically more efficient than other solutions. We love how autonomous the program can be. But we also love that we can go in and get more granular when needed. One of our favorite features is the weekly optimization email which allows us to stay on top of the latest trends and programs. Attribution can be a little sticky depending on which platform you are using to measure it. Engaging and converting website visitors and building funnels to track our customers with the highest potential to convert. We have seen a large increase in retargeting revenue, without the gradual decline that we have seen with other companies. I have to manage my account carefully and I never take Criteo's recommendations because their goal is to spend your entire budget, rather than to maximize your return on investment. If you can manage your bids yourself it works ok, but I don't trust them to do it. Sustained increase in revenue from retargeting. Other companies we have tried, Adroll & Steelhouse, have provided an initial bump in revenue followed by a gradual decline. Criteo has been the only company we have used that has been able to sustain that revenue over a long period of time. "Unauthorized Account Changes - Resulted in over $5000 bill"
It is tough to share something that I liked about Criteo. We were a client for many years, using them as a tool for remarketing to our customers, but the reporting on Criteo is almost non-existant so you really don't know how much value it is bringing that you wouldn't be getting without it. In my experience, remarketing through Google is so much better and I'd highly recommend using Google over Criteo. After years of spending on Criteo without really knowing what we were getting we decided to reduce our bids considerably. We dropped our spend from about $750 per month all the way down to less than a hundred and primarily spend money just on customers that abandoned their shopping cart. In August 2017 either the Criteo system automatically made a change to our account or one of their agents made a change to our account without our approval; they removed all of our segmentation and increased our bids. As a result within 2 weeks we incurred $5,000 worth of charges. I tried resolving the issue through months of emails back and forth with Criteo; they still think I should pay even though I didn't authorize the changes (not sure of their reasoning). Criteo has since sent that invoice to collections. While it has been a massive headache in dealing with them I am glad it happened. After canceling my account with them I switching fully over to Google's remarketing and I can see exactly how my money is spent and my return on spend is really good. Save yourself the headache ... start with Google. Criteo is "easy" but currently doesn't have the tools that allow you to see how you are spending your money. I'd certainly recommend using Google for remarketing to get the best return on investment. Trying to find the best tool to remarket to our customers. "Love Criteo but some difficulties"
Being able to dynamically retarget users across the internet. They've definitely become more transparent the past few years as well. My biggest gripe is that sometimes because the ads offered by Criteo themselves are dynamic, sometimes you'll have to be served an image/headline/ combination that doesn't make sense before you can work with the team to have it resolved. Also pixel issues can be very annoying as well. Capturing what would most likely be lost conversions by being able to retarget them in ways not always easily done otherwise. The platform is incredibly easy to use and Criteo has driven strong overall performance. Driving purchases amongst active users; significantly improved overall ROI. "They messed up the implementation but still expect us to pay for traffic we didn't get"
The platform is easy, especially if you want little/no control. They setup and run everything for you. Don't do it. You have no control over your campaign (you can't even pause it), can't audit their implementation and they are not responsive when they have issues. Unfortunately, they screwed up the implementation and put in their website (www.criteo.com) instead of ours for the ads. We showed them examples, which they fixed. They agreed we should not have to pay for traffic they sent to their site rather than ours, but then stopped communicating. Each month we explain the issue when getting a late notice for the invoice, and each month we get no response. Now they are putting us in collections. "Not what it used to be." Great reach. They have partnerships with high performing publishers allowing them to better reach these users. They are in the business of arbitrage. They are not a in the business in optimizing for what performs best for you, regardless of what they say. They are now using some sketchy tactics to bypass the new safari 3rd part cookie policies in a way that can throw off your analytics attribution. Look into RTB House instead. They are new to the US and their system uses AI to optimize for the the best performance for you - not them. Their US division is being led by former Criteo leadership as well. "Effective way to reach prospective customers"
The dynamic product ad looks very good and is engaging. Criteo keeps our products on our customers minds. It easily gives me the ability to retarget on every ad platform that matters. Love how easy it is to use. How the ads pull dynamically from our Shopify feed. Never really have to update anything, just monitor the bids. Start with a budget according to your current traffic and grow it from there! Generating revenue that would have been lost otherwise. "Great Automated Marketing - but Need More Safeguards"
Budgets can balloon if not watching daily and CPC change take too long occur. Make sure you have someone who will manage spend levels. We have increased conversion rate because Criteo is able to retarget browse abandoned shoppers with products that they were looking at, and potentially products they were looking for. "Finally a Retargeting Agency who gets our objectives!" Low Cost and pay per click model, no insane fees as other agencies. Wish they had more products we would move all our marketing here if they had more channels. Targeting users who have not engaged with us in some time. Reaching our ROAS goals with increase in spend. low maintenance dynamic ads and ROAS was ok.
Criteo shut off our ads right before the holiday shopping season. Also there was now way to limit daily spend, so it required constant manual review. Be careful and investigate other services before deciding on Criteo. Able to advertise our entire catalog without creating individual ads. "Great Engine and Account Support"
The engine is able to optimize toward key KPIs successfully. Account manager is responsive, knowledgeable and helpful. Bid changes typically take about 24 hours to go into effect. Would love the ability to make real-time optimizations. Retargeting ads help recapture revenue lost from browse and cart abandonment. Conversions on retargeting are lower that I would like - but I think this is typical for all display type advertrising. Better flexibility than Google remarketing - and better quality ads. Staying up with our competition in bringing back visitors to our website. "Responsive team that delivers results. " I've been lucky to work with three Criteo reps and have had a consistent experience as a user. The results have been delivered and accurate. After three years, I don't have too many dislikes. I'm a growth marketer now but used to be a Google ads expert. I'd love to see more audience data and uncover ways to optimize and improve other than bids. We use Criteo for more customized retargeting. We've seen more scale on Criteo retargeting than with Google and Bing alone. The ad design and creative is great, but is lacking in many other areas such as customer service and the ability to edit your own prodcut feed. The software needs some major upgrade. Invoicing is so dated and I don't understand why you still do this. Customer Support. It is horrible and very hard to talk to anyone at this company. Honestly, we have considered turning off the software due to the lack of support. Also not being able to put a budget per day is not suitable for a growing company. With the use of retargeting we been able to capitalize on the leads to create more revenue. The only thing I dislike is our low converting funnels- we could work on those a bit more. It's a great way to capitalize on leads that are interested in the product! We are creating more revenue which is great, that is what I would say is our problem. The benefits we realized is that these people are HOT leads, we just need more touch points in able to get them to convert. The platform is easy to use, the UI is easily understandable, and the client service is great. I have yet to run into any issues that their team did not clear up or resolve for me in a timely manner. Attribution models can be slightly confusing at first. A decent-sized product feed is recommended. The more products you sell, the better optimized these campaigns will be. Product retargeting is difficult to manually set up and run efficiently. Criteo's tech dynamically hits users with relevant products at the right times. Are You With the Right Retargeting Partner? Learning about Criteo Dynamic Retargeting? * We monitor all Criteo Dynamic Retargeting reviews to prevent fraudulent reviews and keep review quality high. We do not post reviews by company employees or direct competitors. Validated reviews require the user to submit a screenshot of the product containing their user ID, in order to verify a user is an actual user of the product. Hi there! Are you looking to implement a solution like Criteo?